If you are looking for a new and interesting game you can play on your smartphone that will let you have fun and challenge your skills in the same time, than you should try playing tap games. However, to find and choose the most interesting and challenging tap game among so many can be quite tricky. To make the search easier for you, we decided to search and we discovered one amazing tapper game for all of you – Break It. Let’s see what the game offers you. 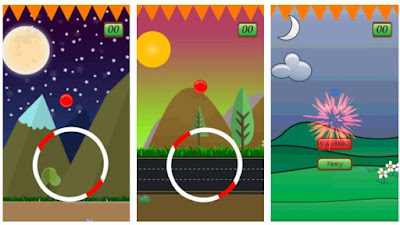 This tapper game is very fun for playing, suitable for every age, and developed on android platform for all players that like to test their skills of precision and enjoy the addictive gameplay. Players have one task to do on the game but very challenging. Just by tapping on the screen players will get to hop the ball and destroy the right parts of the geometrical shapes. Colorful design and switching between day and night backgrounds, the players will always have fun playing, getting a chance to progress in the game if they react fast and precise. The best players get to progress and face even more challenging shapes. Break It is one simple and fun tap game that also challenges and tests the player’s skills of reacting fast and precise. Just one simple task is given to players in order to progress in the game. Players just need to tap to hop the ball and destroy red parts of the geometrical shapes. If the player hits the deadly black area of the shape the game will finish. As the player jumps on the red parts, the geometrical shapes will be destroyed into pieces. Staying longer in the game will make the gameplay more challenging because the rotating speed of the shapes will increase. With every destroyed shape another shapes is emerging. Destroying a lot of shapes and reacting as fast as he can the player will get highest scores and progress in the game. The scores can be shared with friends to test each other’s skills and see which one is the best tapper. Download this game for free on Google Play to destroy the challenging geometrical shapes!